Are you ready for a sugar glider? We are USDA licensed sugar glider breeders in Andover, Ohio; located about 1 1/2 hours east of Cleveland, Ohio, 1 1/2 hours north east of Akron, Ohio and about 1 hour north of Youngstown, Ohio. 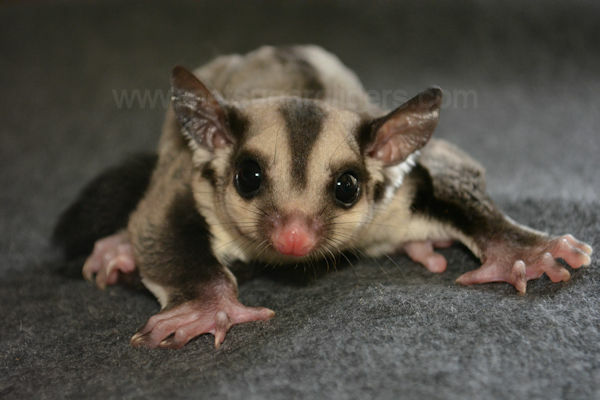 Throughout the year, we have several sugar gliders for sale, but they do sell fast. Join our mailing list for joey updates and pouch sales. 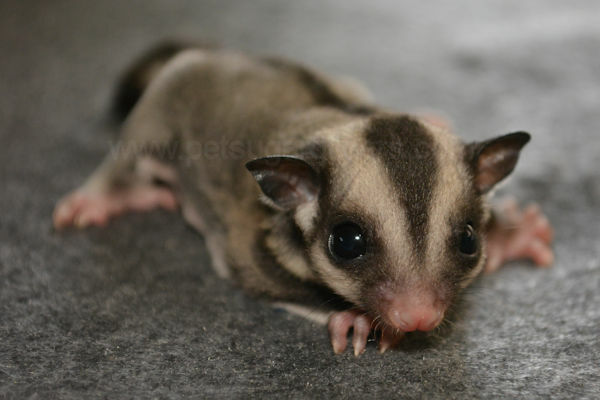 Check out our nursery to view our selection of sugar glider joeys for sale. We specialize in sugar glider/sugar bear color variations and are working with white face, leucistic, albino, platinum, mosaic, gray, caramel, and creamino lines. Our goal is to establish strong bloodlines and breed unique color variations while maintaining excellent records to track bloodlines. Not only do we consider color and genetics when pairing all of our animals, but temperament and desirable physical characteristics as well. As a breeder, our goal is to find knowledgeable and permanent homes for our sugar gliders. 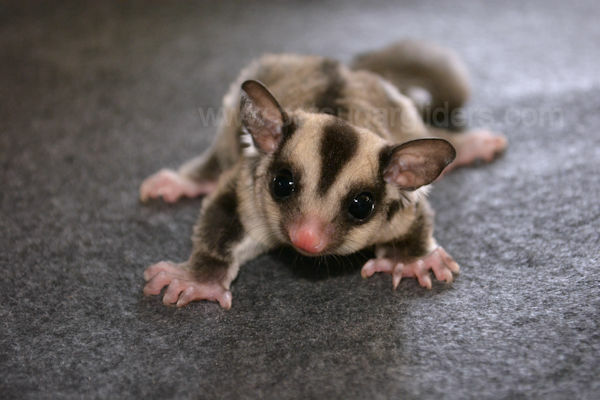 Before you purchase a sugar glider, we will help you decide if they are right for you and your lifestyle. Then, we will help you find the perfect companion(s) to fit your exceptions. We offer support/education throughout the life of each sugar glider we sell. This includes email/text, private FaceBook group, and phone support for emergencies. Are you looking for safe cages? Read more about safe cages. My name is Jennifer Chandler. I am the primary caregiver to all of our sugar gliders. I married John Chandler on July 9th, 2011; a wonderful man and my best friend. We have a blended family of 3 daughters and 2 sons. Our family resides in Andover, Ohio, which is about 1 1/2 hours east of Cleveland, Ohio, 1 1/2 hours north east of Akron, Ohio, 3 1/2 hours north east of Columbus, and about 1 hour north of Youngstown, Ohio. My hobbies include teaching math and science, sewing, web-design and programming, photography, and caring for all my beautiful animals. I spend a lot of time educating potential owners, maintaining our web sites, and making toys for my pets. We have also become an unofficial rescue, as we will never turn away a sugar glider or hedgehog in need of a home or proper care. My family and I spend several hours each day bonding, handling, and playing with all of our animal friends and their babies. We were USDA for 7 years, but in January of 2011 we decided to change our focus while our family transitioned to a new home. Then, in 2014 we decided to return to what we love doing and reapplied for our USDA license. We currently maintain a USDA class A license. We are also a limited liability company (JL Chandler LLC) as of 2016. Since 2003, I have designed and produced several sugar glider pouches and toys. In 2014, I added unique and fun sugar glider embroidery designs. My husband and I operate PSG Pouch Place. All of our items have been proven safe and are sugar glider approved. We are a member of several community safe vendors lists including: Vendor List and Sugar Glider Fanatics. We mainly focus on safe sugar glider cage and bonding pouches, but we also make fleece toys designed to be in sugar glider cages.